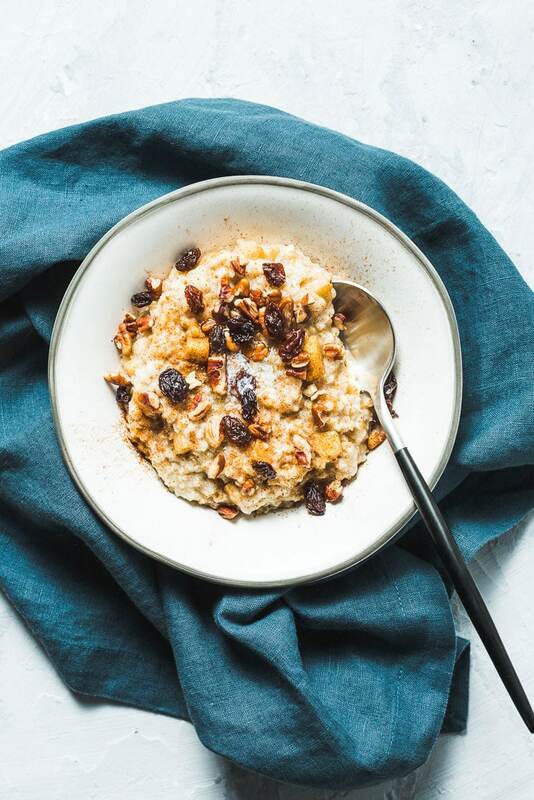 Deliciously nutritious and creamy steel cut oats with sautéed cinnamon apples and topped with nuts, raisins and even a little maple syrup if you dare. 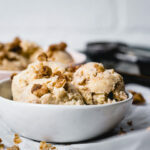 Oatmeal really can be great! No seriously. Great like you would want to eat it for breakfast every day. Not the mushy kind from a little packet, but the kind that takes 30-minutes to cook. Steel cut oats have such a wonderful nutty flavor and the texture is almost crunchy when you bite down. This is the oatmeal for those who don’t like oatmeal. If there were just one thing to eat every morning, it just might be steel cut oatmeal. It’s on just about every breakfast menu, including Starbucks. As tempting it is can be to order, it can be a little difficult to fork (or spoon) over $10 for a bowl of oats that you can make way better at home for way less than $1 a bowl. The texture and flavor of using real steel cut oatmeal is worth the extra time. Instant or short cook oats just aren’t the same. Not only do steel cut oats taste way better than rolled oats, but they can actually be slightly healthier. They have a similar amount of protein as rolled oats, but they have fewer calories and more fiber. With oatmeal being very filling, it’s a great start to the day to help loose weight. There are a lot of options out there. After trying most, Mccann’s brand steel cut oatmeal is the only one to go with. The texture and flavor is far superior to any other brand. Be sure to get the real stuff and not any quick cooking oats, which just aren’t the same. 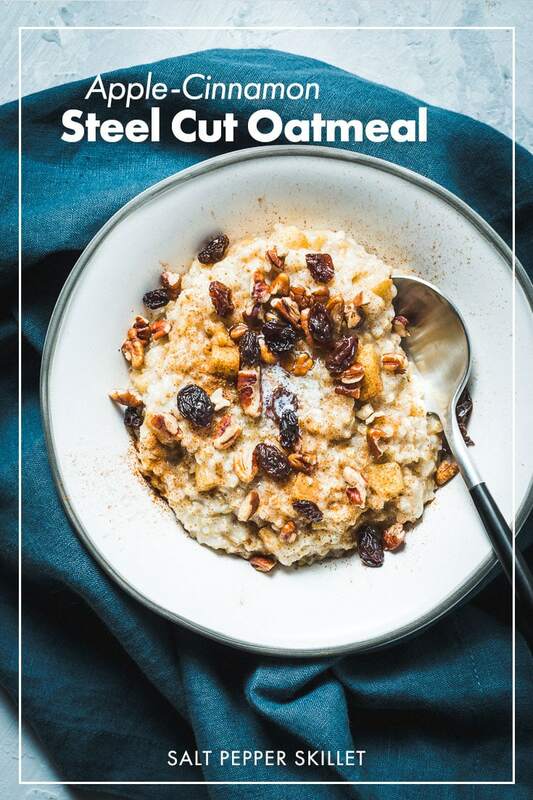 Buy McCann’s Steel Cut Oatmeal on Amazon (affiliate link). Cooking steel cut oats on the stove can be as simple as adding 1 cup steel cut oats to 4 cups briskly boiling water and a pinch of salt. Toasting the dry oats in a little bit of butter before adding the water adds even more flavor. This is similar to toasting rice when making risotto. Frequent stirring is required, so it’s definitely not a hands-off method. But that’s part of the fun, right? 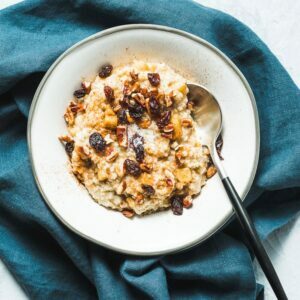 Steel cut oatmeal can totally be made in the instant pot, or pressure cooker, and this makes it hands off. Lightly oil the oats with butter or coconut oil, add the liquid and bring to high pressure for 4 minutes and let the pressure naturally release. 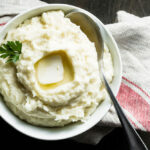 Since it does take about 30-minutes to cook, it’s efficient to cook large batches and freeze in individual portions to easily heat up in the microwave. Experiment with adding different seasonal fruits and other favorite toppings to the oatmeal to mix it up. 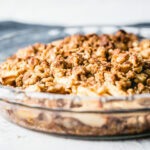 This recipe is geared towards Fall with apples and nuts. Using milk instead of water makes for creamier oatmeal. You can also use part milk and part water. Any type of milk will work. Oat milk is great, too. Don’t forget the salt. Adding salt to the cooking liquid will do a lot to bring out the natural flavors. Melt the butter in a large pot over medium heat. Stir in the steel cut oats to toast, about 2 -3 minutes. Add the milk and water. Bring to a simmer and stir frequently for about 25-30 minutes until the oatmeal is cooked through. Reduce heat to low when most of the liquid has been absorbed. While the oatmeal is cooking, make the apples. To finish; stir in the cooked apples and top with chopped pecans, maple syrup, dried fruit and butter. Heat butter in a small skillet over medium heat. Add the apples and cinnamon and sauté until soft, about 5 minutes.